Monday, boring but not when Wayward Sons roll into town. The Globe Cardiff was set to rock out and make Monday night full of rocking excitement. Now, if you are living up to your band name then expect the unexpected. Tonight with the help of Pete K. Mally as MC and warm-up comedian the band were the opening act without playing an instrument live for twenty-minutes. How? We were treated to a film show first, videos of songs from the amazing debut album Ghosts Of Yet To Come. The screen may have been makeshift, we were standing and not a pot of popcorn in sight. A brilliant idea, as Wayward Sons gave the songs from the album context. Shot in moody light and a derelict run-down area with the focus on a car driving through the lyrics. Imagery that captures what the album is about deviations of society how what we do in the now are the ghosts of yet to come. It was very powerful if only the crowd would just shut up watch and listen. If you want to talk go outside. As the movie closes out with the image of Aldus Huxley’s Brave New World, providing a thought-provoking memory. There had to be a gap for our brains to distil the imagery before live music, Toby Jepson, lead guitarist had obviously thought it through; with a comedian. Spoken words and laughs over corny jokes are just what we needed before the main course of eighty minutes of rocking out with The Wayward Sons. The set list was a celebration of the album with nine tracks to be heard live, loud and full of raw energy. This is what makes live music so special. However loud you play the album you never achieve that raw, sweaty energy that runs through your spine whenever the band you love plays live. Opening with Alive, we definitely felt alive and upbeat as the atmosphere generated by Toby on top form worked like a fizzing bottle of champagne through the venue. As the band took ownership of the stage at The Globe in Cardiff. The crowds were large for a Monday night and the band was too big for the venue. We want them back playing in Cardiff at The Tramshed! 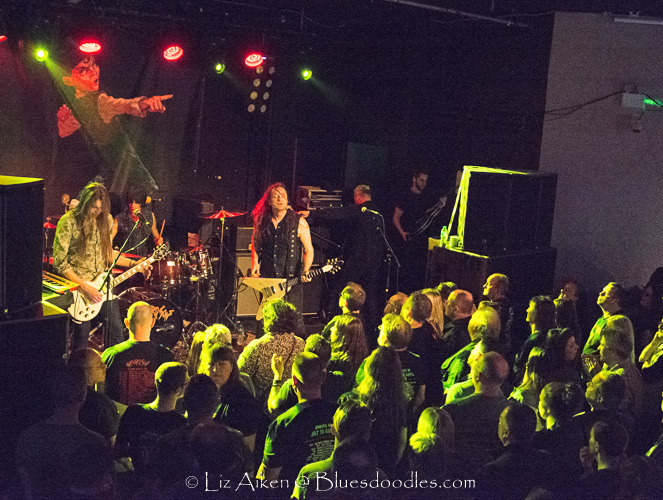 One thing that you couldn’t argue with – the crowd was up for a good time whether this was the first or the second or third time the fans had seen Wayward Sons on the closing night of a very successful first and definitely not the last headline tour! Joining Toby on stage ensuring his vocals and guitar have a cascading shower of tones and textures are rhythm section of Phil on drums and animated bassist Nic. Adding to the melodic flow guitarist Sam and keys from Dave. The quintet creates layers of rock each instrument adding an interesting sound to the strata that creates the complete Wayward Sons sound. A gig is always more than the music, you need the interaction between band and audience to create an intimate atmosphere. Toby excelled tonight with interesting banter about the band, recording the album and the future. They were definitely stoked at the announcement that they will be playing at Rockstock 2018. It is well-known that not every song recorded makes it to the final album. They have found a solution three of the songs has been released on vinyl. Stand By My Heart, the first song the band wrote together was heard live and makes the vinyl a tempting proposition. The audience was enthusiastic when asked to participate on Be Still. A request we ignored. How can you be still with the dynamic driving beat of the band swirling through your ears and wired into your nervous system? As we wait for a follow-up album Radio Denial was a treat new music heard being played by the band is always special and tonight was no different. The closing number captured the moment as we heard Until The End, we didn’t want tonight to end we wanted the music to go on and on. Our demands were answered with two more numbers and then the night closed out with the final refrain from Queen’s Bohemian Rhapsody, closing out the evening with innovative ideas and leaving everyone on a musical high!